Nowadays many people don’t own DVDs or blu-rays because there are other options (such as Netflix, Now TV and Amazon Prime Instant Video) that take up no space and cost less. However, movies and shows can be taken off movie streaming services at any time, and they also require a good internet connection, so a lot of people still prefer to have physical copies of their favourite films and TV programmes. 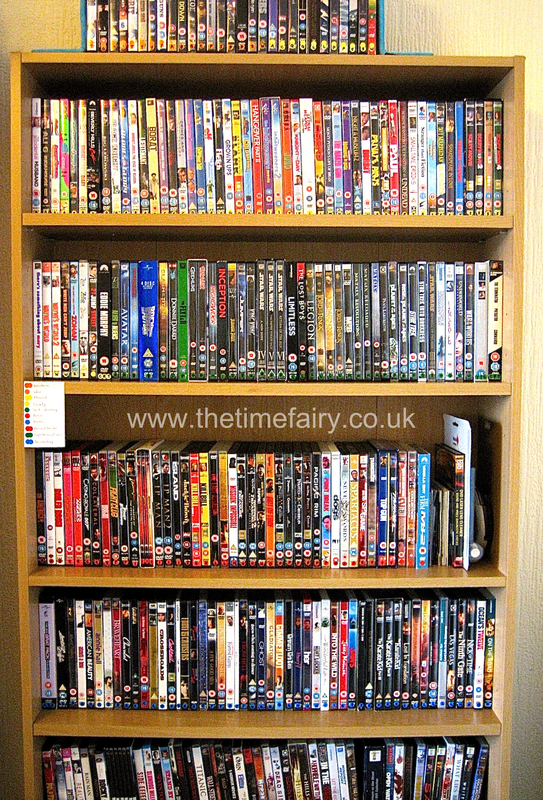 If you are one of these people, and you have a big collection, try this easy way to organise and maintain your collection so that you can find what you want to watch quickly and easily. 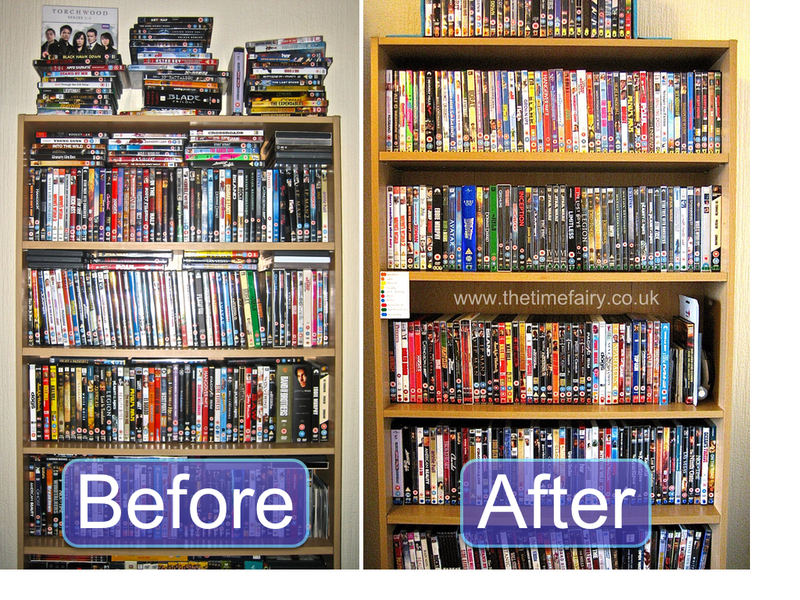 Find all your DVDs or Blu-rays and put them all in one place. Remember to check all the places that you might have odd ones laying around, like by the TV. 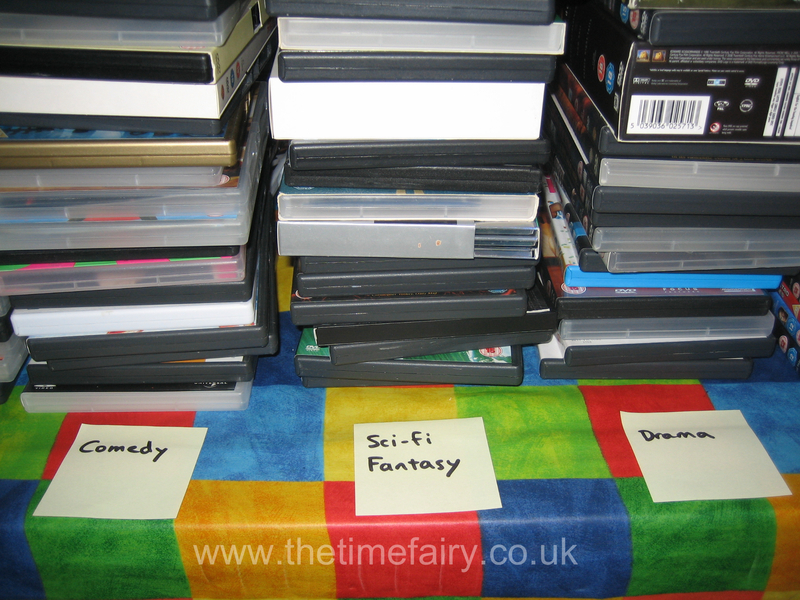 Now decide if you want to see at a glance what genre each DVD is. If so, decide on all the genres you want (e.g. comedy, horror, action, musical). Write each category on a post-it note (1 category per note), and lay it out on the floor or a big table. 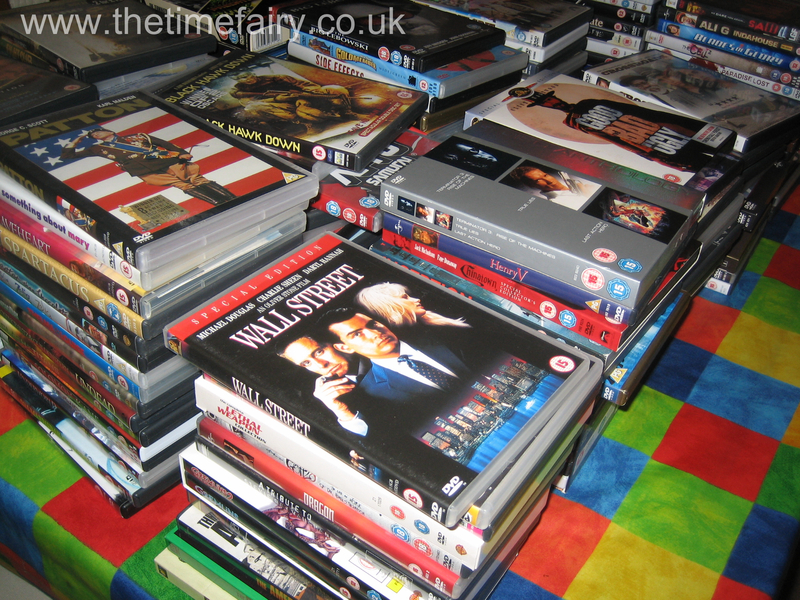 Now take each DVD/Blu-ray and put it into the corresponding pile. – Do you still want it? If not, put it into a ‘donate’ pile. – Is the correct disc in the case? – Is the disc missing? Make a list of any that are missing, and you can decide whether to replace them, or just throw the case out. – Ones that start with ‘the’ or ‘a’ – do you exclude the ‘the’ or ‘a’ when alphabetising? – Multi-boxes – do you want to separate them? If not, how do you want to label them if they each start with different letters? – Those that start with a number…by number after ‘z’, or by the letter that the number starts with? 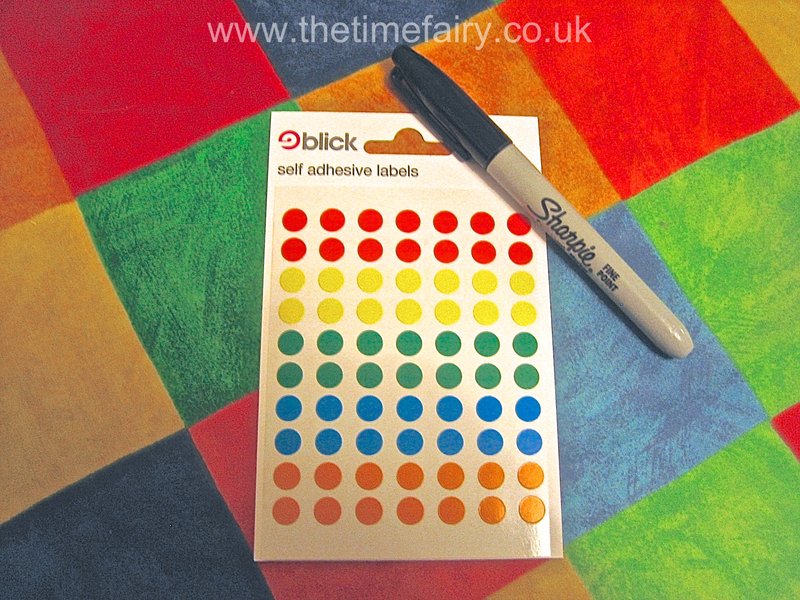 From your set of coloured stickers decide which genre has which colour, and write it down – it’s easy to forget when you have a lot! Genre by genre, add the corresponding coloured sticker to the bottom of the spine on each case, with the corresponding letter written on it in permanent marker (hint: write the letter before you peel the sticker off the sheet, as it will be neater). Put them all back on the shelf in alphabetical order (which you have already ordered). If you chose to pick genres, either keep them in groups, or mix them up on the shelf so that all ‘A’s are together despite genre. 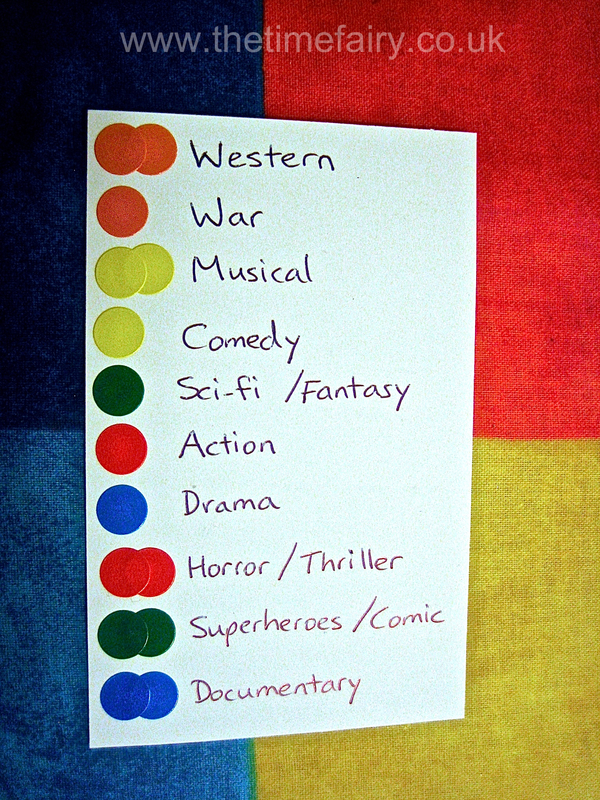 If you tend to pick films by mood, go with genre groups. If you pick by knowing exactly which film you want to watch, then just group them all together. You will still be able see at a glance what sort of movie each one is by the colour. Put up a ‘key’ so that everyone can understand the colour codes. Donate all the unwanted DVDs/blu-rays. That’s it! It’s not rocket science, and it saves you time in the long run! Now that you’ve done all the hard work, always put them back in the right place to keep the system working – it won’t take any more time to slot it in the corresponding letter, but will save you time when you are next looking for a particular film. Please comment if you try it, or if you have a good system yourself. If you would love to get this done, but don’t have the time or energy, The Time Fairy can do it for you.